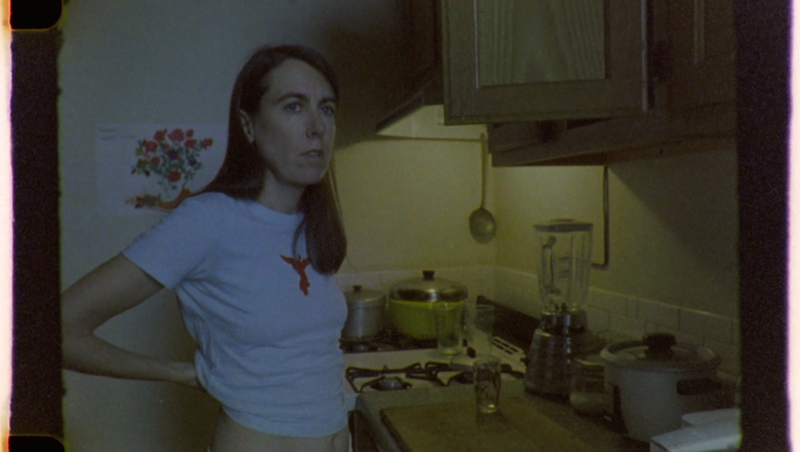 The first in a series of Moving Image Commissions premiered in the Walker Cinema and released online June 1 for a limited run, Moyra Davey’s new 28-minute film, Notes on Blue (2015) is a response to the late British filmmaker Derek Jarman. Here, Bentson Scholar Isla Leaver-Yap discusses the artist’s exploration of mortality, color, and identity. Braiding together disparate observations and personal accounts, Notes on Blue is an episodic meditation on blindness, color, and the life and work of British filmmaker Derek Jarman (1942–1994). From the opening scene of her 28-minute video and throughout the work, Davey continually folds time back on itself. In her prefatory monologue the artist establishes a new orientation; she states that the beginning is not actually the beginning at all, but the middle. The middle to which she refers is, meanwhile, an anachronistic fragment: Blue Ruin, a film storyboarded ten years ago, a year before the artist went blind in one eye. Notes on Blue is the result of Davey’s enquiry and responses to the work and legacy of Jarman the filmmaker, gardener, political activist and, perhaps most significantly for Davey, Jarman the writer. At the invitation of the Walker Art Center last year, Davey began her commission by poring over the late filmmaker’s notes and journals. Jarman was a prolific writer, whose voluminous autobiographical books and personal sketchbooks occasionally spilled over into autofiction. His style of writing — intimate and uninhibited — is an intriguing complement to Davey’s own confessional and lyrical writing that often takes the form of short essays and personal notes, published in parallel with her exhibitions of photographic work or else employed as spoken-word monologues to her essay films, including Fifty Minutes (2006), Les Goddesses (2011), and, now, Notes on Blue. Davey amassed her personal reflections on Jarman, rewriting them into her own pre-existing texts, spawning new ones, and incorporating these alongside her own Super-8 and digital video footage both recent and old. Together with an associative and personalized array of quotations, diary entries, and anecdotes, the reflective thrust of Notes on Blue also takes detours into the personal lives of American poet Anne Sexton, Argentinian writer Jorge Luis Borges, German filmmaker Rainer Werner Fassbinder, and British musician PJ Harvey. Each of these figures are amalgamated into Davey’s personal constellation of equivalences, and their words are suspended epigraphically within her own narrative — a spoken monologue that is itself mediated through a prerecorded audio prompt that plays over headphones worn by the artist as a form of aide memoire. As Davey explains by way of Woolf, the inner logic of the personal note collapses reader and writer together. It excuses the need for linear narrative and permits content to jump between times and places. Subject matter is meanwhile arbitrarily bound together by physical proximity on the page as much as in the mind of its author. It is in this vein that Notes on Blue traverses its episodic sketches, purposefully constituting its own interior sense of time. Davey’s preoccupation with noting and recording the quality of time and its effects has recurred throughout her expansive practice. Her art directly engages with the interplay between personal time and the narratives it produces, whether through her analogue photographs of fridge-freezers, clocks, or dust (all portraits of time accrued or suspended); videos that re-examine her formative family portraits and illustratively places them alongside the diarized lives of Mary Wollstonecraft and her family and lovers; or her short and informal collection of published texts that intersperse quotes from critics, poets and artists with her own reminiscences and responses. Integral to Davey’s inquiry, too, is the artist’s inhabitation of domestic time and space — a site that might offer respite from the industrialized clock of work time, as well as the potential to withdraw from social interactions that would inhibit personal reflection and interiority. In many of Davey’s previous photographs and videos, her New York apartment has served as the private backdrop, where the residue of home living is observed and captured: lint is glimpsed gathering under furniture, incongruous patches of floor tiling are flattened out photographically in two dimensions, groaning bookshelves and stacks of old records provide their own indexical drama. But in Notes on Blue the space of the artists’ home is not simply a feature to be observed, but an architecture that is subjected to a domestic choreography. As Davey recites her monologue, she paces the corridors, moving back and forth between doors that swing open and closed as if she and the architecture are part of the same metronome, her movement demonstrating depth and space for the benefit of the screen. Rooms become a stage for the recitations of her personal notes, and Davey’s wandering is akin to didactic memory game of Roman Rooms. As the artist’s voice attentively heeds her audio prompts, so too her movement through the apartment finds its own rhythm and familiar, measured gravity. The home gradually takes on its own character, becoming an unlikely witness and container to histories that would otherwise remain separate. Windows, too, are a key feature in Notes on Blue. They initially appear as occlusions to vision; their brightness casts the room in shadow, and the artist stands before the camera in murky silhouette. The intensity of the interior is amplified, and the brilliance of the outside is rendered a blank — an extremity of vision, or perhaps a lack. Such qualities recall the attitudes of Austrian architect Adolf Loos, who once remarked that a cultivated man does not look out of the window, “his window is ground glass; it is there only to let the light in, not to let the gaze pass through.” And yet, as Notes on Blue begins to unfold to include dream-like sequences that appear like tarot cards evenly distributed through the work — an abandoned bird’s nest, a dazzling moon, a dog vanished through jump-cut, a young woman wearing angel wings in a New Jersey train station, and an auspicious shot of construction laborers suspended between Davey’s apartment block and her neighbor’s — the apartment windows emerge as dilating apertures opening out onto the world, climaxing with a wide open shot of the city at dawn. Notes on Blue is a work that is always attempting to gather an atomizing identity. Just as she compares Jarman to “Pasolini, by way of Fellini,” so too Davey’s own subjectivity is similarly distributed among her sources and influences. Her irrepressible stream of personal notes and lyrical associations occasionally tip the narrative over into the fantastic, where the spoken monologue and the images to which it is tied abrade each other in perpetual and productive tension. Towards the end of the film, Davey acknowledges that the shift between her use of the analogue technologies she once knew but is quickly forgetting and the digital ones she is struggling to learn has produced a “strange suspension” in her life. Notes on Blue shrewdly articulates this particular feeling of suspension by straddling different technologies, eras, mediums and ideas. Its common thread, then, is not only the figure of the artist — the conduit and protagonist who reorders events and materials into a personal pattern of correspondences — but the sustained register of intimacy, whose language composes a delicate treatise on the daily experience of aesthetics and mortality.